I found these pictures of an apparently old beaded chief's top hat online. And that's it, I spent way too much time trying to find some history, anything, zip, zero, nada. I am sure you found the Knife Edge Top Hat dude on Facebook. He seems to lean toward beaded brims over bands. I like the topic. Etsy has a bunch for sale. It may be the first time that a Cellar IOTD came up first on a Google Image search. On the same day, too. Nope, don't do facebook, ever. I did a google image search and a Tineye search which produced nothing. I just took that first image and did a Google image search. They told me their best guess is a boot??? Trade usually benefited both parties in an exchange, since value (of goods traded) is in the eye of the beholder. However, from a strictly economic standpoint, European traders came out well ahead of their Native American counterparts. Except for guns and powder, Europeans exchanged relatively inexpensive trade goods like pots and pans, beads, and cloth for Indians’ furs, which took an entire season for hunters to amass. Europeans were dependent on Native Americans for the furs which had been almost depleted in Europe. However, because they weren’t aware of the European situation, Native Americans couldn’t always leverage their goods to better advantage. The fur trade was fueled to a surprising extent by men’s fashion. Beaver-felt hats were particularly in vogue during the late 1600s and 1700s, and so many beaver were procured for their pelts that hunting areas were exhausted in certain areas in the New World even before 1700. European fur traders ranged further and further looking for fur suppliers, which led to exploration, cultural exchanges, and warfare. By the middle of the 1700s, European goods had been introduced–and readily accepted–into most native peoples’ lifestyle. In certain areas like the Great Lakes, nearly all Native American men owned muskets or rifles, and women relied on metal cookware and European cloth. The fur trade began to dwindle when animals became scarce or disappeared due to over-hunting, and when silk hats became fashionable in Europe. During the second half of the nineteenth century, Lakota people across the plains defended their land and resources against encroaching settlers in a series of conflicts known as the “Sioux Wars.” In response to the violence, a number of Lakota leaders—including Chief American Horse—traveled to Washington, DC to negotiate for peace with the U.S. government in the late 1880’s. 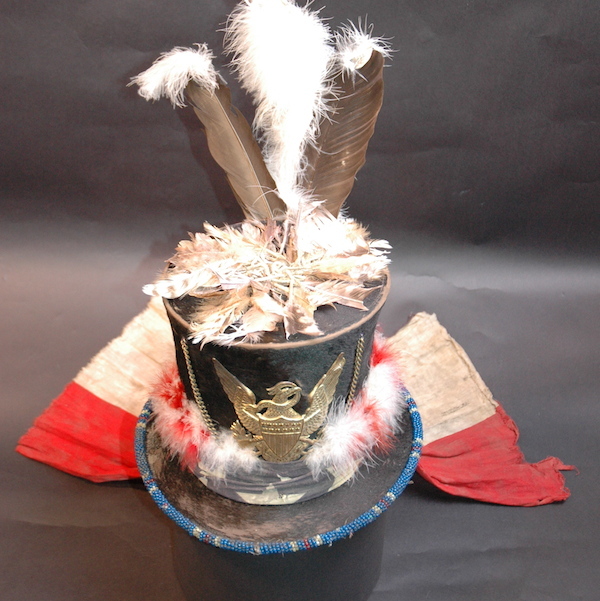 During their visits, federal government officials often presented Lakota tribal leaders with gifts, including European-style suits and beaver skin top hats like this one. When American Horse returned home, his wife thought the top hat was plain and adorned it to incorporate elements of Lakota culture and identity. Adorned items like this one became symbolic of its owner’s leadership and involvement in history. American Horse’s top hat was recently part of a major exhibit at the National Museum of the American Indian in Washington, DC called Song of the Horse Nation. For a longer article, see Top Hats on the Plains. Follow this link for more authentic Native American-decorated top hats.